In my case, the rtcxds logfile was at 100%. The quick and dirty way to get around it is just to perform a backup of the logfile to disk, but I’d prefer to give it some extra headroom, as well as a maintenance plan so that we don’t face this problem again. First, let’s perform an initial backup of the logfile to disk so that we know it’s safely stored somewhere before we start messing with it. 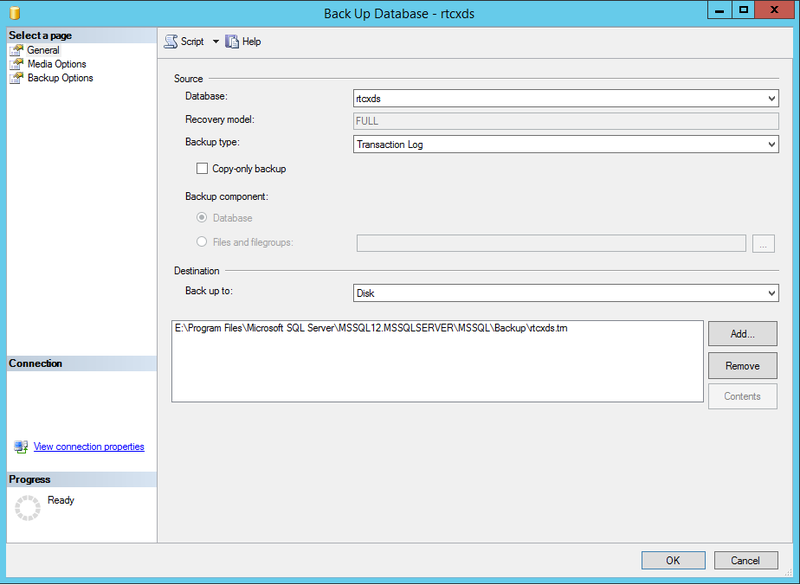 Connect to the database with SQL Management Studio, right click on the RTCXDS database and select tasks>backup. Select Transaction Log and ensure that Copy-only backup is unticked. In the destination section, choose a location and filename. Click OK and wait for the backup to complete. In this command we’ll run another backup, but this time we won’t write it anywhere. This will ensure that we’re able to modify the actual file in the second line, which will set the new maximum size of the logfile to 50GB. Change this to whatever you prefer and execute by either pressing the execute button or hitting F5. The final step is to set up a maintenance plan to back up your transaction log to disk on a regular basis. I’ll cover that in another post.